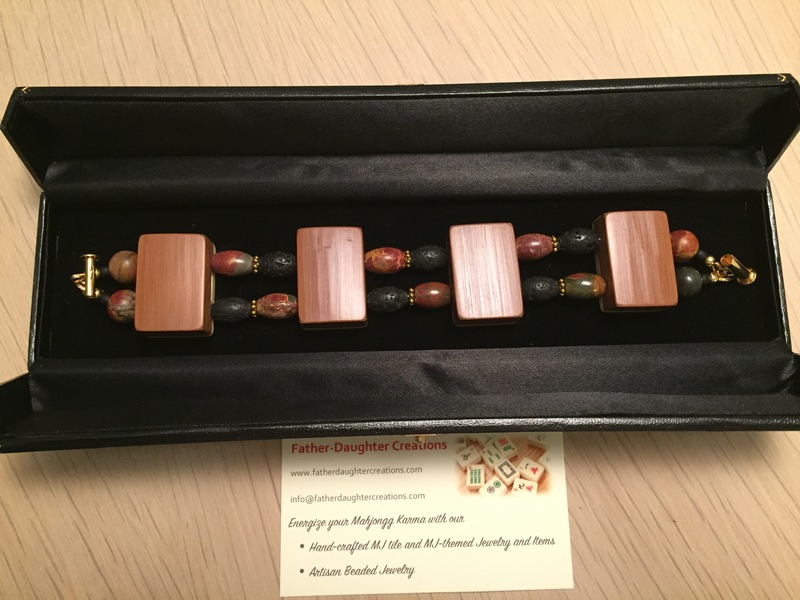 Last week I received a message from readers of this blog, Lisa and her husband Jerry, telling me that I would be receiving a special gift from them. 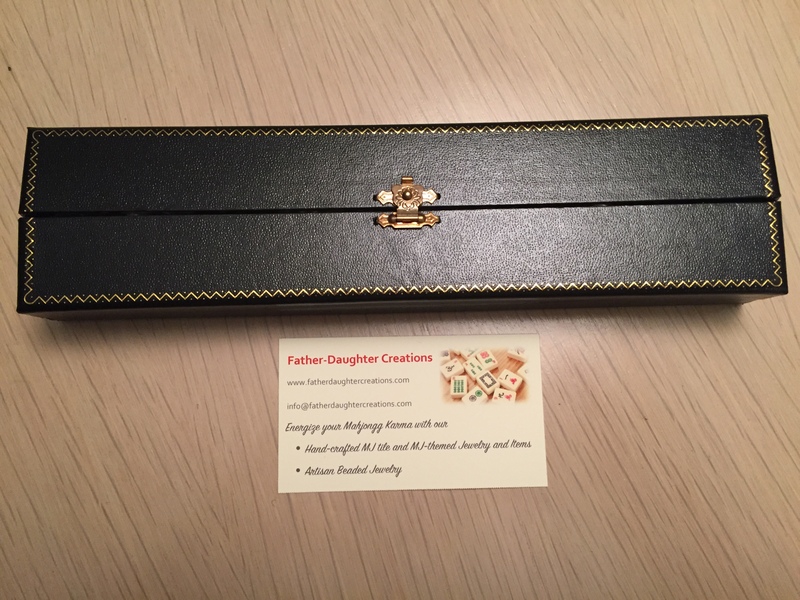 Yesterday a beautiful package arrived with a lovely note… I unwrapped the package to find a beautiful box… …which contained a “Father-Daughter Creations” made by Jerry, and his teenaged daughter, Sabrina: So, what is the story with these “Father-Daughter Creations?” First I must tell you that learning about the bond between Jerry and his daughter, formed by their love of working together on this Mah Jongg-related jewelry, has truly touched my heart. She will have these memories for the rest of her life and I can only imagine how much they will always mean to her. Jerry sent me a detailed letter and now I will share part of it with you. …I am a cardiothoracic surgeon and business executive, and I first learned the basics of simple jewelry making and selling to generate some income when I was a college student. 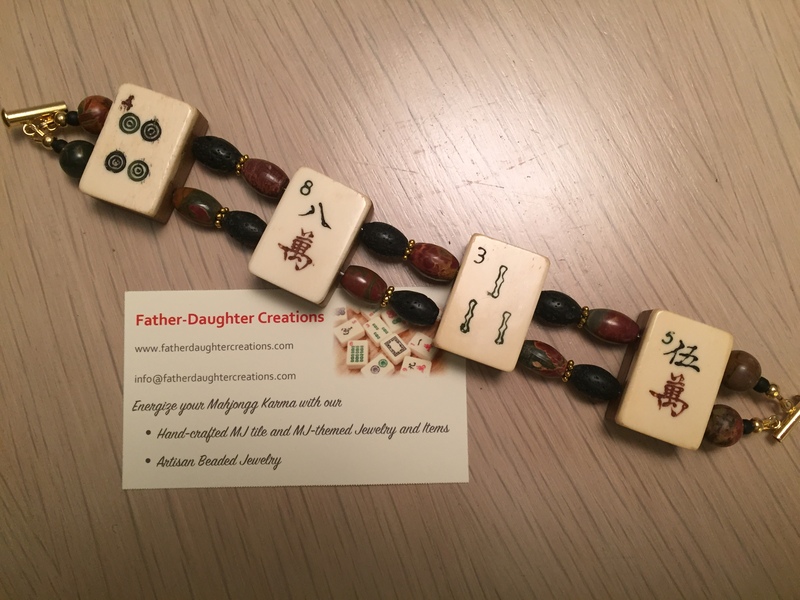 Several years ago, I started a project with our daughter, Sabrina (then in high school), teaching her how to make jewelry with a Mah Jongg theme. 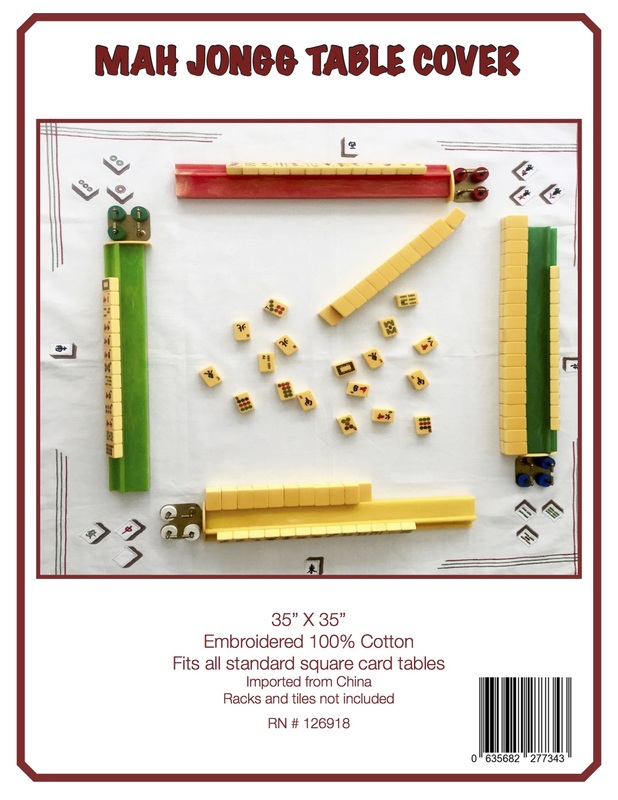 We were inspired by Lisa’s passion for Mah Jongg and the inherent beauty and versatility of the tiles as a basis for an artistic project. 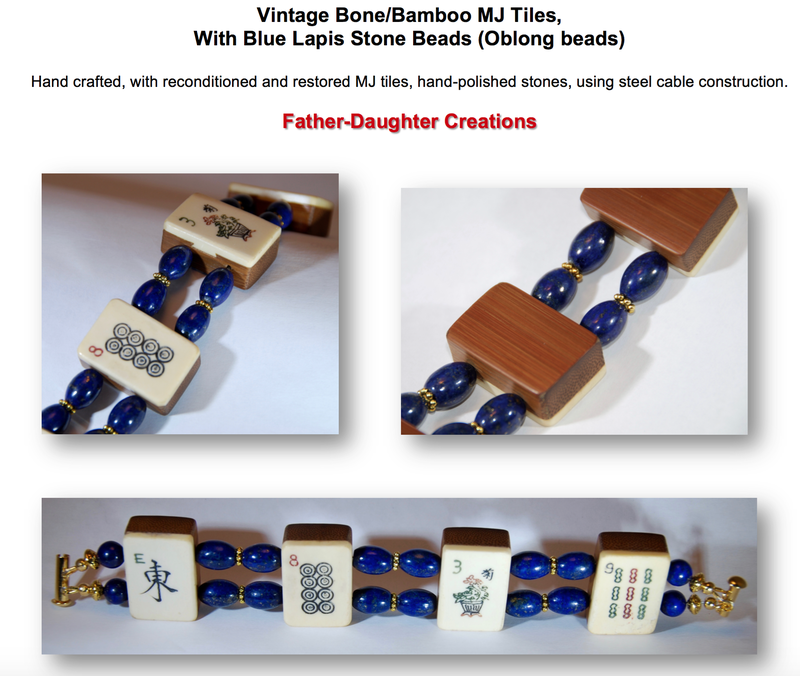 Sabrina and I had a lot of fun setting up ‘Father-Daughter Creations’, and it gave us an opportunity to share something special, and to spend time together making and selling the jewelry. 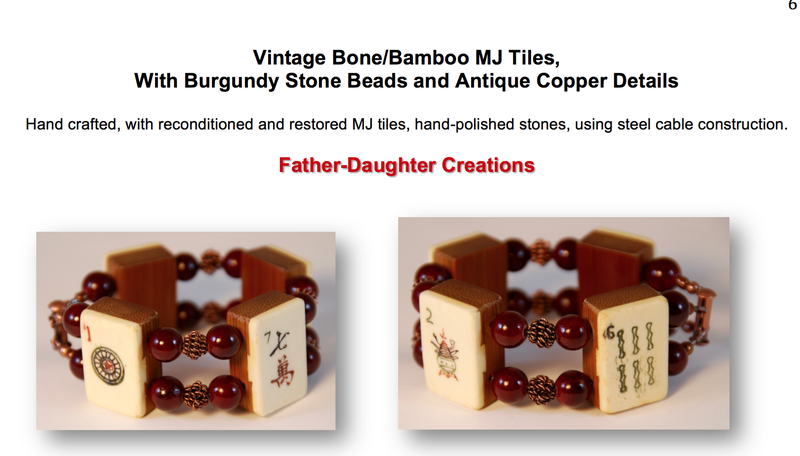 Sabrina and I made custom-assembled pieces including earrings, bracelets, necklaces, and pins, as well as other MJ-themed items such as wine glass charms, bookmarks, and napkin rings. We used antique and vintage MJ tiles that I sourced internationally from sellers and from estate sales, as well as a wide variety of beads and ornamental findings, including some unique pieces I purchased overseas when traveling internationally for business. 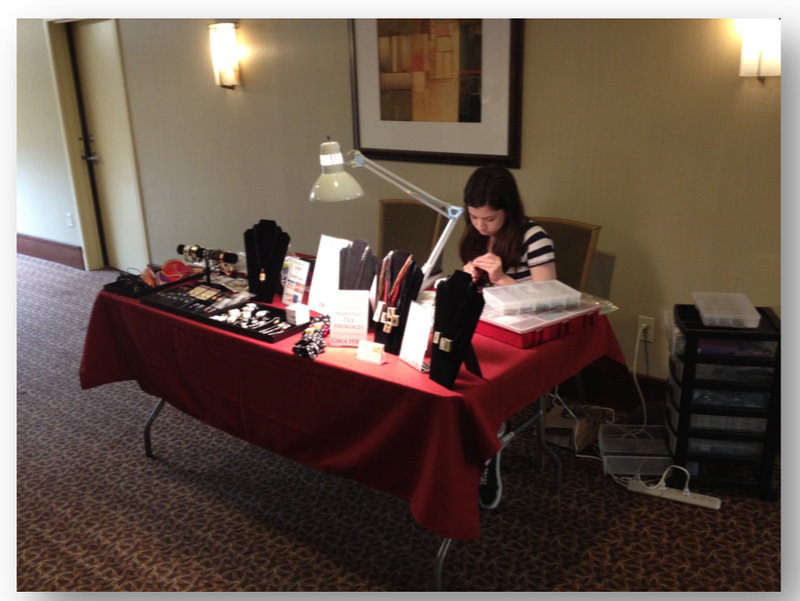 Below is a photo of Sabrina making custom jewelry to order during a local Mah Jongg tournament. Through Lisa, we began getting invitations to show and sell our creations at various local MJ tournaments, and it was a great opportunity for Sabrina to experiment artistically with different materials and MJ tile media, and she successfully built a following of loyal customers as well as making a little pocket money on the side. Frequently, the tournaments were held to benefit local synogogues or charities, and Sabrina happily donated a portion of her proceeds to the cause. 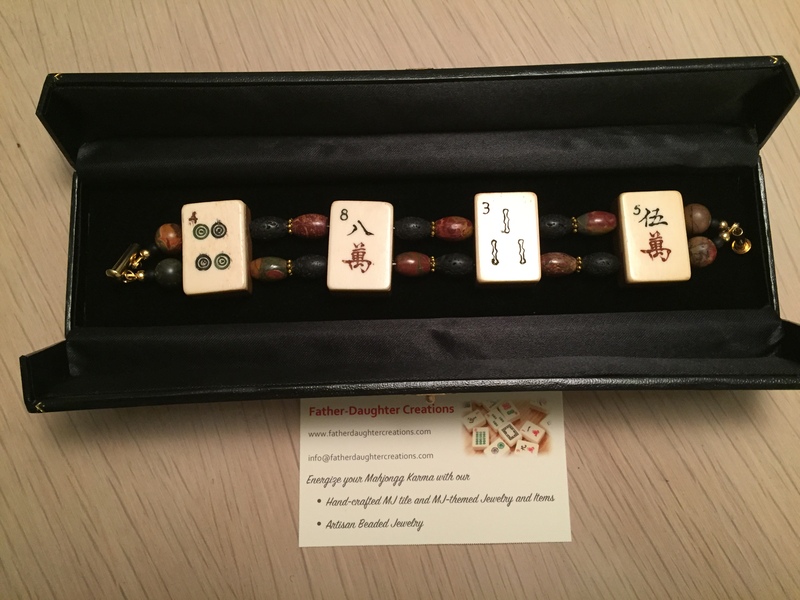 Now that Sabrina has moved on to college, I maintain my interest in making jewelry as a hobby, and I became fascinated with the challenge of crafting high–quality jewelry featuring antique Mah Jongg tiles. I purchased several lots of antique and vintage tiles from sources in the US and abroad, and have been working out the methods to restore these tiles. I use mostly bone and bamboo, as these seem the most interesting and adaptable for jewelry making. Many of these tiles arrive worn or faded, often in poor structural condition, and they are quite fragile due to their age and handling. 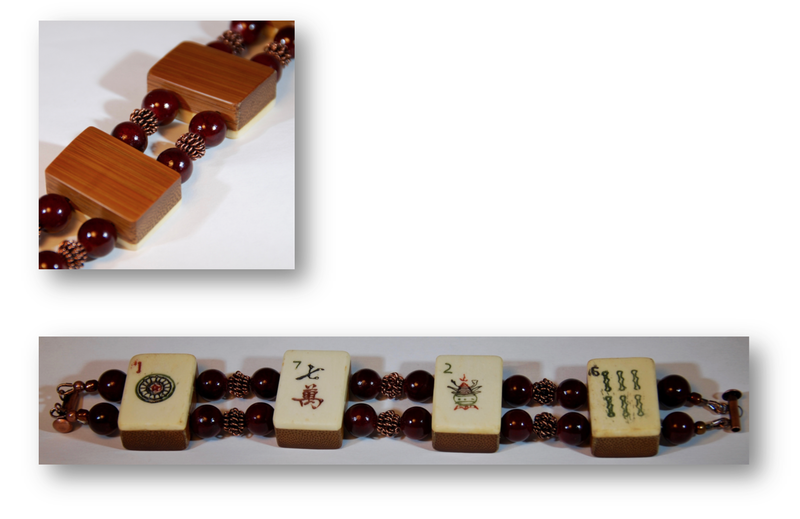 Through trial and error, I have devised processes that carefully restore and rejuvenate the bamboo backings as well as clean and preserve the bone faces, and have learned how to optimally prepare the tiles for jewelry making (such as mounting with bales or drilling holes). While at first it might seem this would be simple, there is actually a significant challenge to getting high-quality, reproducible results because each tile is slightly different in size and shape and construction. I am currently working with several lots of bone and bamboo tiles where the bamboo was originally lightly brown-stained, and I have been restoring these tiles with beautiful results. 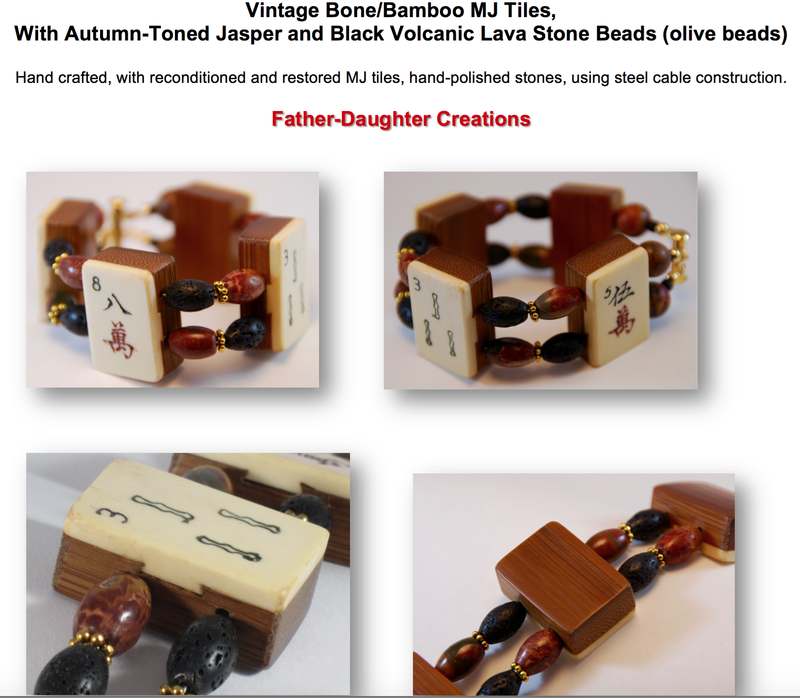 I find that the warm luster of the reconditioned bamboo and the aged bone seem to pair well with earthy, autumn colors for making jewelry. I have been experimenting with stone, glass and porcelain beads in different textures within this color pallet, as well as metallic ornaments. 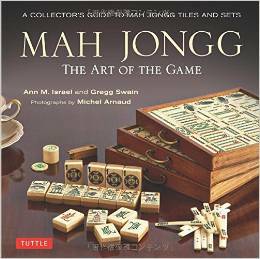 The results are a pleasing and interesting juxtaposition of beautifully restored vintage Mah Jongg tiles with complimentary colors and textures to create some unique works of Mah Jongg art. 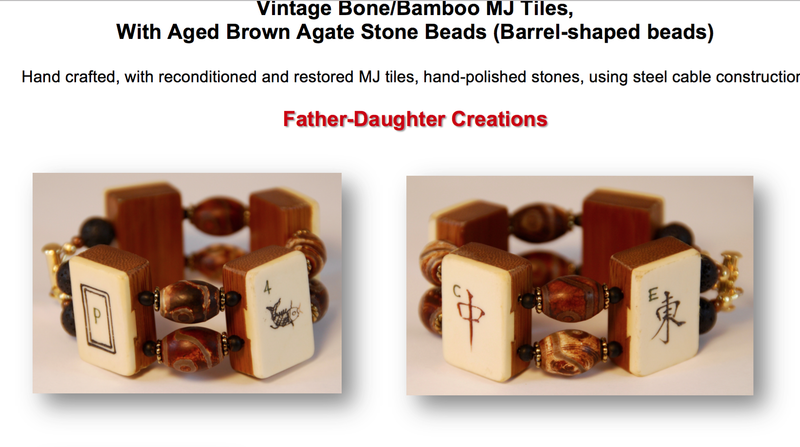 It gives me great pleasure to share one of these Mah Jongg tile bracelets with you, as I feel confident you will appreciate the MJ beauty and craftsmanship. Your bracelet will be going into the mail later this week. 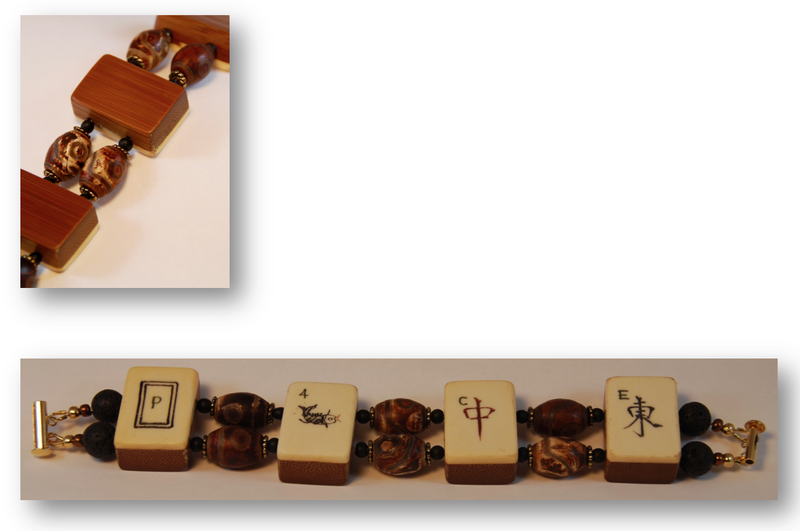 Below are some photos representing several of the different style bracelets I have been working on using this lot of tiles. I am also experimenting with different bead types, textures and colors, and I am always on the lookout for something unique that will create a special look that befits the tiles’ history. I hope you enjoy wearing the bracelet as much as I did creating it. 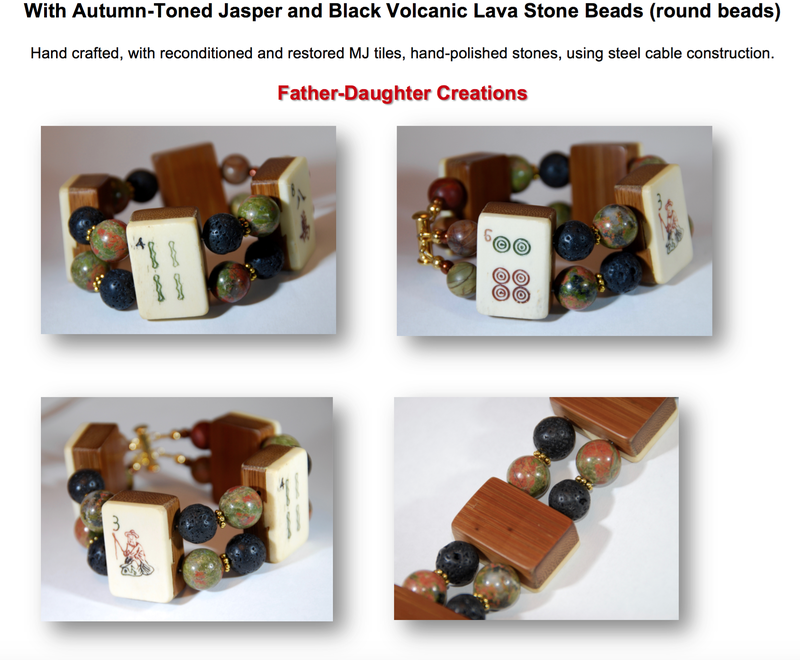 This entry was posted in Mah Jongg and Me and tagged Agate, Antique Copper, Black Volcanic Lava Stone Beads, Blue Lapis, Father-Daughter Creations, Jasper, mah jongg, mahjong, Vintage Bone Bamboo Tiles on November 3, 2015 by Mah Jongg and Me. What a beautiful way to have family time and preserve these beautiful tiles. 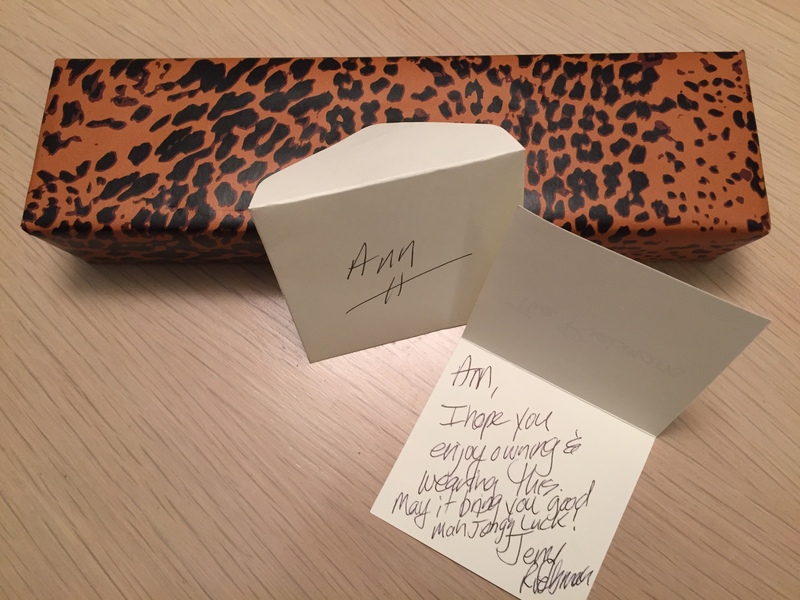 The bracelets are very pretty and Ann, I hope you enjoy yours. Thanks, Judy. Such a nice message from you! What beautiful jewelry. Great talent and love shows in every piece.